HMH Books for Young Readers, 9780618605699, 32pp. One pumpkin makes a tasty pie. Two pumpkins can be carved into grinning jack-o’-lanterns, and a couple hundred more make for a decent pumpkin patch. Gather one thousand pumpkins and you’ll have a grand fall festival. But what happens when a town has an accidental abundance of pumpkins? What do José and his brothers do with a mountain of pumpkins? An EXPLOSION of pumpkins? Step into Pumpkin Town and see! As a teacher, Katie McKy saw many children make mistakes. She also saw many children want to make their wrongs right. Had she allowed it, some kids would have worked all night to fix their mistakes. As a gardener, McKy once planted too many pumpkin seeds. She saw that a good thing can be a bad thing when the vines start to grow every which way. 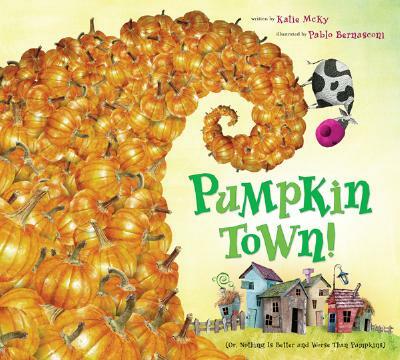 McKy twined what she learned from children with what she learned in the garden to write Pumpkin Town! Pablo Bernasconi is an award-winning graphic designer who was born in Buenos Aires. Pablo loves things that grow: puppies, trees, hair, knowledge, children, clouds, and pumpkins! His artwork has been published in picture books, magazines, and newspapers all over the world. He lives in Patagonia, Argentina--still a wild place where nature can often over-rule humans' attempts to control it. The story's open ending could initiate an amusing writing project. The collagelike, colorful computer-generated illustrations, featuring the siblings in denim overalls and patterned shirts, are clever and entertaining. A good fall read-aloud, especially for those wanting to avoid Halloween-themed books.